I absolutely love the holidays and I love to decorate. But, as much as I love these things I love to make my own decorations for the holidays even more. This year I had a few helpers. Thankfully my daughters and my husband pitched in, because I not only made my table decorations, I made the decorations for our holiday banquet at church. I would like to mention that I was encouraged to write this article by the site BloomNation. BloomNation is a "flower delivery service that helps local florists through their online marketplace." While I didn't use fresh flowers for this tablescape, fresh flowers could easily be added to small pint sized mason jars for more color. I think I would use white flowers and green ivy if I were to add fresh flowers to the design. This would draw out the white in the doilies, and emphasize the green. 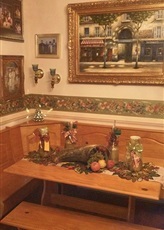 There are several different elements in the pictured table decoration, and most of them are hand-made. The pieces which are not hand-made were purchased at the local thrift store. I believe in up-cycling and I love to make treasures out of discarded items. For this design let's start from the table top upward. The first element is a gold table runner. (This was someone's old wedding castaway.) It made a great foundation to pull together all the individual pieces. 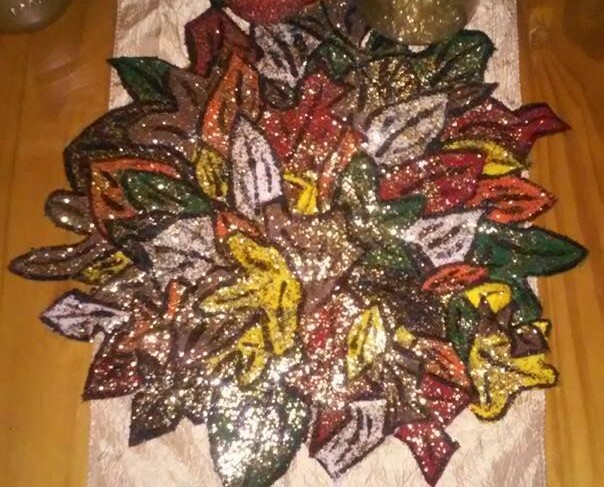 The next element is the harvest colored leaf doilies. I had originally wanted to make them out of silk floral leaves, but I couldn't find them at any of the local craft stores. I had to really think about how to accomplish the look, and that's when I turned to felt. I was surprised how good they turned, out and I think I like them even more than I would have if I'd used silk flowers. I want to do this again with red and green felt to make poinsettia doilies. Cut out several variations of leaves in a variety of colors. 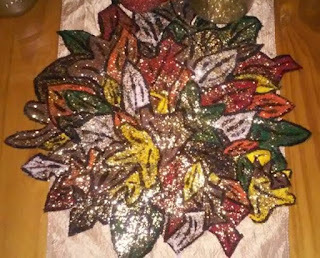 I'm not certain how many leaves we actually made, but we used about six sheets of different colored felt. (I used red, green, white, yellow, orange, brown and black.) Set the finished leaves aside. Cut a 12-inch circle from a large paper bag. This will be the foundation for your doily. Working in small sections from the outer edge inward paint Mod Podge across the surface of your paper circle. Add the felt leaves, again working from the outer edge inward. Make sure to overlap each leaf so that they look like they have fallen naturally onto the paper. Brush Mod Podge across the top of the leaves, and let dry. Paint a second layer of Mod Podge across the top, and sprinkle glitter over the wet glue. Paint another layer of Mod Podge over the glitter and let the glue dry. Paint the outline of the individual leaves with black acrylic paint, and add decorative veins to the leaves. Let the doily dry completely before using it. I made used three doilies in this table display. This is perhaps the easiest element of this display. I simply dumped the paint into the Mason jar and swirled it around until the inside was completely covered with paint. Make sure the paint dries thoroughly before using. Hint: Let the jars dry upside down to prevent the paint from pooling in the bottom. Paint a thin coat of Mod Podge onto the outside of the candles, and then sprinkle gold glitter over the glue. Paint another layer of Mod Podge over the glitter. WARNING: I do not know if the candles can be used at this point. I did not light them, so do so at your own risk. For each Mason jar cut 16-inches of ribbon. Place the pillar candles on top of the Mason jars. Mine were slightly larger than the jar, so I ran a bit of Mod Podge over the rim of the jars before setting the candles on them. Tie one section of ribbon around the bottom of the candle and top of the jar. Tie a contrasting ribbon over that ribbon. (I folded my top ribbon in half.) Then tie a bow with the two ribbons. For each small-mouth juice jar, cut two sections of contrasting ribbon about 12 inches in length. 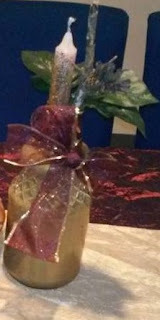 Place the taper candles inside the jar, and then add the leaves, twigs and pine cones. Tie one ribbon around the top of the jar and around the other elements. Tie a second ribbon over that one and make a bow. Viola! 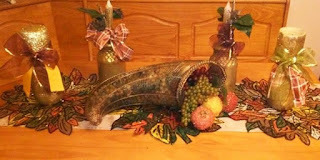 The cornucopia was a thrift store find, and I filled it with plastic grapes and beaded fruit.